Orange Torsade Bracelet Wood Beaded Jewelry, "Lamphan Belle"
In orange and brown, this torsade bracelet is by Sumalee Nawakul. 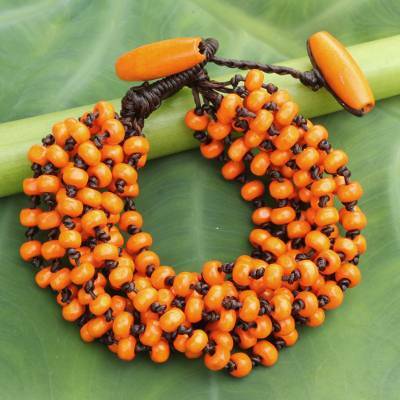 She crafts the bracelet by hand with dyed orange beads of littleleaf boxwood, creating 10 hand-knotted strands that twist into a bracelet that can fasten at two different lengths. You can find wood beaded bracelet 'Lamphan Belle' by Sumalee Nawakul in jewelry categories such as Eco-Friendly Bracelets, Nature Bracelets, Wood Bracelets, Polyester Bracelets, Beaded Bracelets and Torsade Bracelets. Enjoy exploring these sections for other Novica treasures. Sumalee has struggled for many years. She has a small shop in a local market but the sales are erratic, tied to tourism, and do not provide enough income to meet her expenses. Her Novica sales are essential to her survival and the survival of those who depend on her. She is working very hard to increase her sales. Sumalee helps to support her mother in a unique way. She hires her mother and other older workers to help with the hand-finishing of her statement jewelry created from wooden beads. As a child, Sumalee learned sewing, embroidery and weaving from her mother. She still practices these arts today and often teaches them to younger artisans. Sumalee Nawakul has received 3 microcredit loans with 0% interest from Kiva and Novica, the first for $1300 and the most recent for $1400. Sumalee does not have any children but she loves being an aunt. She helps her younger sister with the cost of her niece's education. My grandmother loves unique jewelry, of all types, from everywhere. Since she is aging (she'll be 82 in July), she now prefers to keep her accessories light in weight...but weight only. She loves color, design, movement & everything else that you can pack into an item with out adding ounces. These totally delivered for her & she wears them quite often. All the colors add a pop to any outfit & make them easy to match to other items. I have purchased 6 various necklaces (torsades) & bracelets from Sumalee and love them all! I'm about to buy 5 more! Needless to say, I am quite taken with her amazing craftsmanship! Thank you so very much, Sumalee! The colors in the Trang Belle bracelet make me so happy! I have worn it every day since receiving it! !